An unprecedented opportunity to be a part of a national effort to support local economic initiatives. 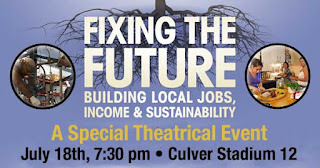 This documentary, showcasing working models for thriving economies, will screen in at least 50 theaters in cities across the U.S. Due to a wildly successful PBS version, the filmmakers have made a new, feature length version of the documentary that you can be among the first to see. Transition US is calling it an "online event." The film highlights effective, local practices such as: local business alliances, community banking, time banking/hour exchange, worker cooperatives and local currencies. 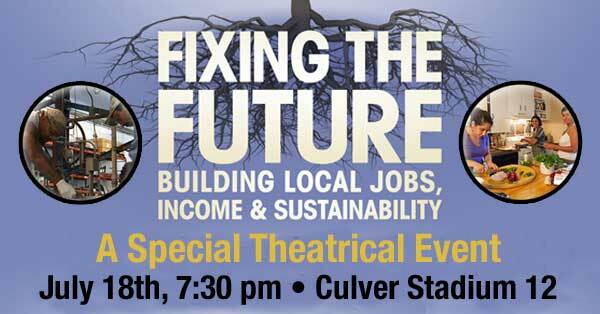 Following the documentary, audiences will enjoy a pre-taped discussion panel featuring luminaries Bill McKibben, Majora Carter, Mike Brady and David Brancaccio. Tickets are $11.75 per adult. Available at the box office, or for purchase online (by Monday, 7/9).